← A Design Challenge, a Grand Design Challenge, if you will. Set in a dystopian world during the year 2052, the central plot follows rookie United Nations Anti-Terrorist Coalition agent JC Denton, as he sets out to combat terrorist forces, which have become increasingly prevalent in a world slipping ever further into chaos. As the plot unfolds, Denton becomes entangled in a deep and ancient conspiracy, encountering organizations such as Majestic 12, the Illuminati, and the Hong Kong Triads throughout his journey. Deus Ex had a cyberpunk theme, a world of shadowy corporations and many corruptions of the human soul, ranging from a generally materialistic culture to body implants producing cyborg entities that no longer had much humanity. While looking a lot like a First-Person Shooter (you see through the character’s eyes and kill things), the game also had a great deal of stealth play (sneaking around trying very hard not to get noticed, shot or both). However, what sets DE apart from most other games it that the choice of how you solved most of the problems was pretty much left up to you. This was no accident. The fact that you could solve 99% of the problems in the game by using different forms of violence, many forms of stealth or a combination of these was down to the way that the game was designed. When I was at Game Masters at ACMI, Melbourne, over the weekend, I was able to read the front page of a document entitled “Just What IS Deus Ex” by Warren Spector. Now, unfortunately, they had a “no photographs” rule so I don’t have a copy of it (and, for what it’s worth, I also interpreted that to mean “no tiresome hand transcription onto the iPhone in order to make a replica” ) but one of the most obvious and important design features was that they wanted to be able to support player exploration: players’ actions had to have consequences and players needed to be able to make their plans, without feeling constrained by the world. (Fortunately, while not being the actual document, there is an article here where Warren talks about most of the important things. If you’re interested in design, have a look at it after you’ve finished this.) Because of this, a number of the items in the game can be used in a number of quite strange ways and, while it appears that this is a bug, suddenly you’ll run across an element of the game that makes you realise that the game designers knew that this was possible. Do not climb if red lights active! For example, in the Triad-run Hong Kong of 2052, there is a very tall tower on one edge of the explorable area. There are grenades (LAMs)in the game that adhere ‘magnetically’ to walls and then explode if armed and someone enters their proximity. However, it is possible to use these grenades to climb up walls, assuming you don’t arm them of course, by sticking them to walls, getting close enough to hop up, placing another grenade above you and then doing the same thing. With patience, you can climb quite high. Sounds like a bug, right? Yeah, well, that’s what I thought until I climbed to the top of the tower in Hong Kong and found a guy, one of the Non-Player Characters, standing on top. This was a surprise but it shouldn’t have been. I’d already realised that there was always more than one way to do things and, because the game was designed to make it is as easy as possible for me to try many paths to achieve success, the writer had put in early hints designed to discourage a ‘blow everything up’ approach. The skill system makes it relatively easy for you to make your life a lot easier by working with what is already in the environment rather than trying to do it all yourself. 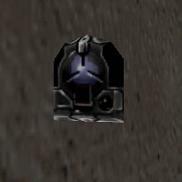 In terms of the grenades, rather than just being pictures on a wall, they became real world objects when placed and were as solid as any other element. This allowed them to be climbed and the designers/programmers recognised this by putting a guy on top of a tower that you had no other way to get to (without invoking cheats). The objects in Deus Ex were designed to be as generally usable as possible. The sword could open crates as well (Ok, well much better) than a crowbar could and reduced the need to carry two things. Many weapons came with multiple ammunition types, allowing you to customise your load out to the kind of game you wanted to play. Other nice features included the fact that there very few situations of ‘spontaneous creation’, where monsters appeared at some point in a scripted scene, which would have enforced a certain approach. If you were crawling in somewhere from completely the wrong side, everything would be there and ready, rather than all spontaneously reappearing when you happened to approach from the ‘triggering’ side. The big advantage of this is that you feel a great deal of freedom in your planning and implementation and, combined with the fact that the game reacts and changes to the decisions that you make, this makes the endings of the game feel very personal – when you finally choose between the three possible endings, you do so feeling like the game is actually going along with the persona that you have set up. This increases the level of engagement, achievement and enjoyment. One of Mark Guzdial’s recent posts talked about the importance of good design when it comes to constructing instructional materials and I couldn’t agree more. Good design at the start, with a clear idea of what you’re trying to achieve, allows you to build a consistent experience that will allow you and your students to achieve your objectives. Deus Ex is, in my opinion, considered one of the best games of the 21st century because it started from a simple and clear design document that was set out to maximise the degree of influence that the player could feel in the game – everyone who plays Deus Ex takes their own path through it, has their own experience and gets something slightly different out of it. I’m not saying it’s that easy for educational design as a global issue, but it is a very good reminder of why we should be doing good design at the very beginning of our courses!